The father of the man suspected in the weekend bombings in New York and New Jersey called the FBI in 2014 to say his son was a terrorist but later retracted it, saying he meant the young man was hanging out with gangs and acting like a thug, a law enforcement official said Tuesday. The father contacted the FBI after Ahmad Khan Rahami was charged with stabbing his brother, according to the official, who was not authorized to discuss the investigation and spoke to The Associated Press on condition of anonymity. The official said that the FBI looked into the matter, but that the father, Mohammad Rahami, rescinded his comment and said he meant his son was hanging out with the wrong crowd. The FBI reviewed its databases and found no credible connection to terrorism or threat to the U.S. from the son, the official said. The information emerged as Ahmad Khan Rahami, 28, was being held on $5.2 million bail, charged with five counts of attempted murder of police officers in the shootout that led to his capture Monday. Federal prosecutors said they were weighing charges over the bombings that wounded 29 people. Rahami, a U.S. citizen born in Afghanistan, remained hospitalized after surgery for a gunshot wound to his leg. He was captured in Linden, New Jersey, after he was discovered sleeping in the doorway of a bar. His father told reporters Tuesday outside the family's fried-chicken restaurant in Elizabeth, New Jersey, that he called the FBI two years ago. But asked whether he thought his son was a terrorist, the father said: "No. And the FBI, they know that." Ahmad Khan Rahami was arrested in 2014 on charges of stabbing a person in the leg and possession of a firearm. A grand jury declined to indict him, despite a warning from the arresting officer that Rahami was probably "a danger to himself or others." 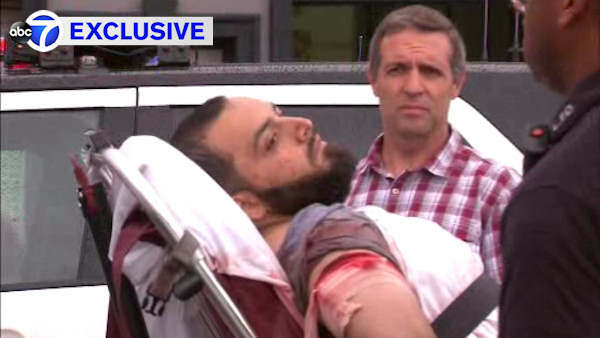 William Sweeney, the FBI's assistant director in New York, said on Monday that the FBI had gotten a report of a domestic incident involving Rahami some time ago, but the allegations had been recanted, and "there's nothing to indicate that currently he was on our radar." The bombing investigation began when a pipe bomb blew up Saturday morning in Seaside Park, New Jersey, before a charity race to benefit Marines. No one was injured. Late Sunday night, five explosive devices were discovered in a trash can at an Elizabeth train station. Investigators have not publicly tied Rahami to those devices. Rahami provided investigators with a wealth of clues that led to his arrest just 50 hours after the first explosion, according to three law enforcement officials. His fingerprints and DNA were found at the scene of the Manhattan bombing, they said. His face was clearly captured by surveillance cameras near the spot of the blast. Electronic toll records show a car to which he had access was driven from New Jersey to Manhattan and back to New Jersey the day of the bombing, according to the officials, who spoke on condition of anonymity because they weren't authorized to discuss the case. Those and other clues spurred officials to release his name and photo Monday morning. "A lot of technology involved in this, but a lot of good, old-fashioned police work, too," New York Police Commissioner James O'Neill said Monday. Officials said they have no other suspects at large but cautioned they are still investigating. Rahami wasn't on any terror or no-fly watch lists, though he had been interviewed for immigration purposes while traveling between the U.S. and Afghanistan, one of the law enforcement officials said. Rahami and his family live above their restaurant, First American Fried Chicken, and the family has clashed with the city over closing times and noise complaints, which the Rahamis said in a lawsuit were motivated by dislike of Muslims. A childhood friend, Flee Jones, said Rahami had become more religious after returning from a trip to Afghanistan several years ago. Still, some of the restaurant's customers said Rahami was more likely to talk about his interest in cars.